Personal Safeguards Group News, Releases and Industry Data, Analysis and Other Items related to Service Contracts, Limited Warranties and Specialty Insurance Solutions. Personal Safeguards Group, LLC ("PSG") shares its 2019 initiatives to support consumer retail and OEM clients. This represents an example model for structuring coverage for Product Warranty Insurance for an Original Equipment Manufacturer (OEM) or seller. This example utilizes a Self Insured Retention or Deductible. An expected frequency of failures and cost for repair/replacement (severity) is used to calculate an estimated anticipated claim amount. Then, based on the term, quantities and conditions a fee is determined to cover the risk of loss in excess of the anticipated claim amount. Personal Safeguards Group, LLC launches several new Marine and RV limited warranty solutions for original equipment manufacturers ("OEM") and sellers. These solutions allow an OEM or seller to offer longer term warranties for a single cost and offering balance sheet relief. Personal Safeguards Group, LLC launches a new LED solution for manufacturers and sellers offering up to 10 years of coverage on parts and/or labor. At the Retail Selling Price to the Consumer the US Consumer Service Contract Industry is projected at approximately $53.7b for 2018 for Vehicle Service Contracts, Consumer Electronics and Appliances, Home Warranties and Mobile Technology. 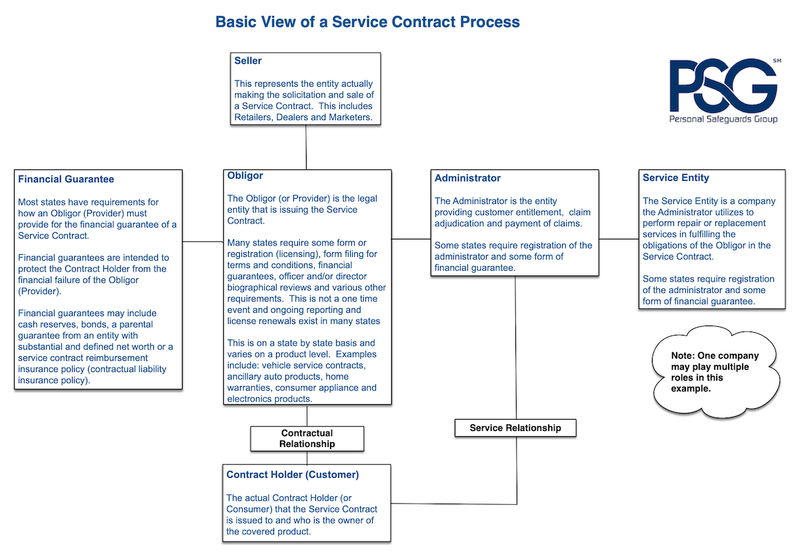 Detailed process flow outlining many of the necessary steps the need to be accomplished to form a service contract provider. On a regular basis Personal Safeguards Group, LLC surveys dealers, administrators and consumers to gain insight into behavior, trends and opinions related to the Service Contract Industry. Personal Safeguards Group, LLC launches several configurable Auto Deductible Reimbursement Insurance programs. Personal Safeguards Group, LLC launches several configurable Home Deductible Reimbursement Insurance programs. A summary level view of the critical service contract process elements and how they fit into a process flow. Brief summary comparing Product Recall Insurance and Product Warranty insurance.